To come in taxi ask the Mokef, to come on foot ask the Museum of Marrakesh. Foundouk : equivalent of the caravanserai of the East, it consisted of multifunction buildings. It served as a hotel for people passing and their mounts when located next to the main entrance gates of the city. It was also used as a warehouse for commercial or industrial use when it is near the souks. This one very old was completely restored in 2000. The Restaurant Le Foundouk is part of the “world’s best sky-high and rooftop restaurants" according to CNN 2016. 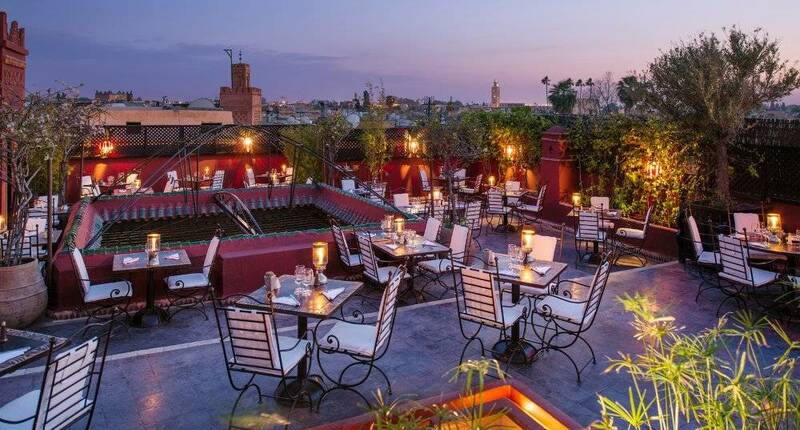 After the effervescence of the medina and souks of Marrakesh, the rooftop restaurant Le foundouk asserts itself as the best place to enjoy Moroccan or international cuisine with an outstanding view above Marrakesh. Relaxed and trendy atmosphere, sumptuous view, the rooftop restaurant is a unique place! You fall immediately in love with this balmy and peaceful roof terrace. Marrakesh, the red city, extends out of sight with its many markets, gardens, palaces and mosques. After sunset, the atmosphere is just magic, ideal for a romantic dinner. The terrace is softly lit by candles and recreates an atmosphere worthy of the Arabian Nights. A unique moment in a place which looks like any other. Moreover, the word magic stays on all the lips. The 34th edition of the Marathon des Sables will take place from 5 to 15 April 2019 in the heart of southern Morocco's Sahara.